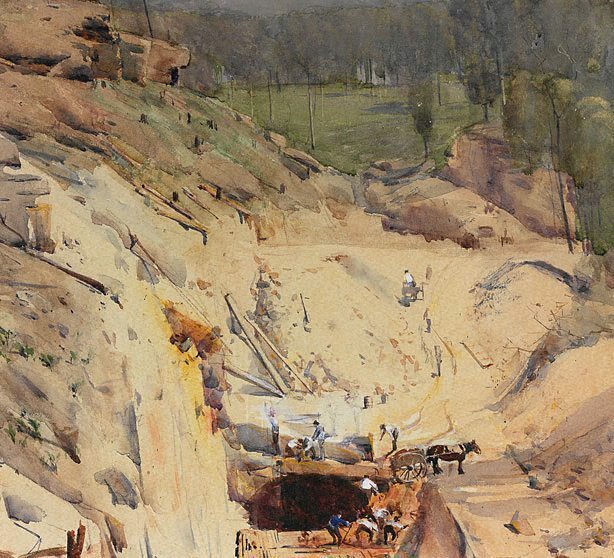 Arthur Streeton and Tom Roberts are celebrated for having given a distinctly Australian flavour to landscape painting at the end of the nineteenth century and into the twentieth, painting what is popularly considered an Australian version of Impressionism. It was Streeton's ability to create a particularly convincing sensation of Australian space and light in his paintings, with fresh and vigorous paint handling, that most sets him apart from his friends and contemporaries. On the recommendation of Julian Ashton, his painting 'Still glides the stream, and shall for ever glide' 1890, was purchased by the Gallery in the year it was painted. It was also the first painting by him to be bought by a public gallery, precipitating his move to Sydney. Furthermore, it is one of several masterpieces by Streeton in the Gallery's collection, rivalling his archetypal 'Fire's on' 1891 (purchased in 1893), 'The railway station, Redfern' 1893, and 'Cremorne pastoral' 1895. Streeton entered the watercolour in the Gallery's 1891 watercolour prize unsigned or inscribed, as was required, dating it (incorrectly) only on its return to him. Signed and dated l.l. corner, brown watercolour "Streeton/ 1892 [sic]". Maurice Brodzky (Editor), Table talk , 'The Victorian artists exhibition', pg. 7, Melbourne, 27 May 1892, 7. Jane Clark, Golden summers: Heidelberg and beyond , 'Naturalism and Nationalism', pg. 128-149, Melbourne, 1985, 140. Smike to bulldog: letters from Sir Arthur Streeton to Tom Roberts , Sydney, 1946, 5, 20, 21, 47 (colour illus. ), dust jacket (colour illus.). Tom Roberts: father of Australian landscape painting , Melbourne, 1935, 186. Australian images: Prints, drawings and watercolours from the collection , Sydney, 1979, 9. Arthur Streeton 1867-1943 a biographical sketch , Brisbane, 1987, 32, 82-83 (colour illus.). Letters from Smike: the letters of Arthur Streeton, 1890-1943 , Melbourne, 1989, 36, 37, 40. Anne Gray, Radical revisionism: an anthology of writings on Australian art , 'Arthur Streeton: shadows and symbols', pg. 175-181, Brisbane, 2005, 175. Robert Hughes, The art of Australia , 'The heidelberg school 1885-96', pg. 53-73, Melbourne, 1970, 63. Hendrik Kolenberg, Look , 'Australian images from the past: whether rarely seen or familiar, these works move and delight us', pg. 24-27, Sydney, Apr 2005, 26. Hendrik Kolenberg, 19th century Australian watercolours, drawing and pastels from the Gallery's collection , 'Introduction', pg. 6-16, Sydney, 2005, 4 (colour illus., detail), 12, 100, 101 (colour illus.). Two hundred years of Australian painting: nature, people and art in the southern continent , Tokyo, 1992, 79 (colour illus.). Barry Pearce, Art and Australia (Vol. 23, No. 4) , '"Fire's on": some thoughts on a national icon', pg. 527-530, Sydney, Winter 1986, 530 (colour illus.). Jeff Rigby., Oz Arts magazine [issue 9] , 'Fire's on: the circumstances surrounding the painting by Arthur Streeton of 'Fire's on!' 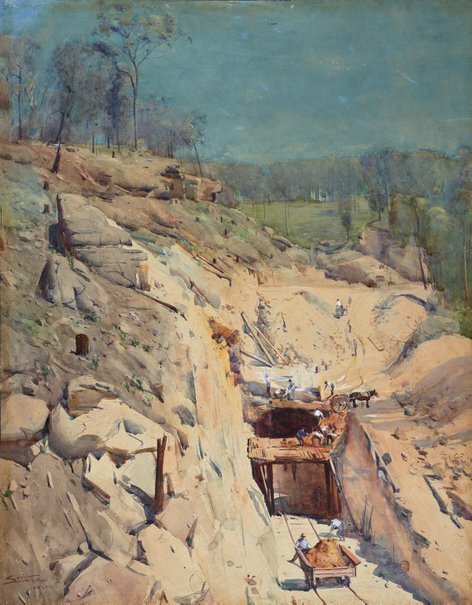 and the Lapstone railway tunnel deviation of 1891', Wentworth Falls, Spring 2016, (colour illus.). D.H. Souter, Art and architecture: the journal of the Institute of Architects of New South Wales , 'Arthur Streeton, artist and his Australian work', pg. 225-229, Sydney, 1905, 226 (illus.). Sydney Ure Smith and Leon Gellert (Editors), Art in Australia [series 3, no. 60] , Sydney, Aug 1935, 29 (colour illus.). Arthur Streeton: painter of light , Milton, 1993, 80. Editor Unknown (Editor), The Sydney Morning Herald , 'An exhibition of watercolours', pg. 5, Sydney, 01 Dec 1891, 5. Editor Unknown (Editor), The Sydney Morning Herald , 'Opening the new gallery, the Society of Artists, an arts and crafts exhibition', pg. 7, Sydney, 02 Oct 1897, 7. Editor Unknown (Editor), Magazine of art , 'Spring exhibitions of pictures, Sydney, N.W.Wales', pg. 341, London, May 1898, 341.